I'm sad this project is over because these clients were really fun to work with! They were laid back and easy to please and really trusted my vision for their space. 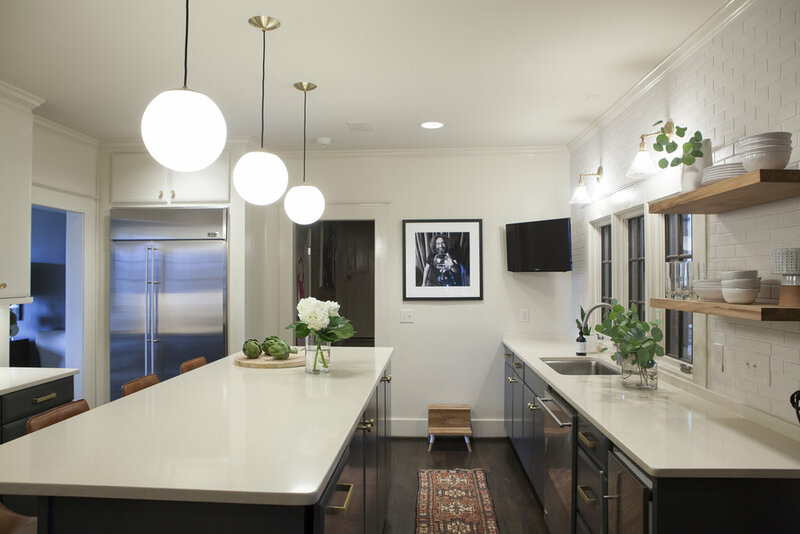 This project started out as a tiny powder bath & a small kitchen facelift. It turned in to more of a major kitchen facelift and half way through, the clients decided to add in their master bath and their outdoor patio space as well. I'm so pleased with how each space turned out! I'll stick to the kitchen here and share the other spaces in a separate post. This kitchen design was only five years old, but the clients really wanted something different. The mirrored backsplash and the stainless steel shelving and accent wall made the space feel cold. The space doesn't get much natural light so one million recessed lights had been added to offset this, but it was too many and added a harsh, unflattering light. The clients wanted to make the kitchen feel more warm and inviting and I definitely think we accomplished that!! My plan for the space was to brighten it up, but also bring in warmth and depth. 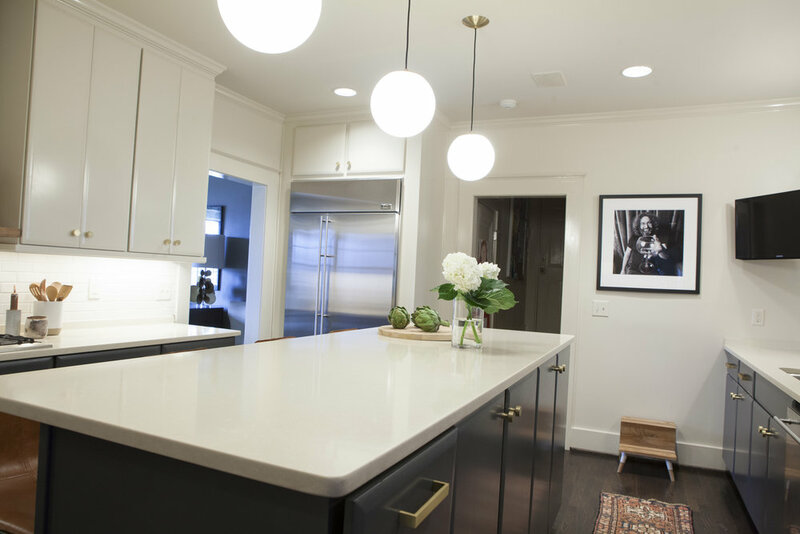 We removed many of the recessed lights and instead brought in pendants over the island and sconces over the sink that brought a soft, more flattering light. We added depth by painting the lower cabinets a beautiful, deep navy/charcoal color. For warmth, we selected handmade tile in a warm white in place of the mirrored backsplash and stainless steel insert above the cooktop. We repeated that same tile on the opposite wall from counter to ceiling to add visual interest. We replaced all the stainless steel shelving with floating wood shelves and we switched out the satin nickel hardware with warm brass. Leather barstools for the island and a vintage turkish runner with hints of coral and navy were the perfect accessories to finish out the space. There were no layout changes, major construction or demo, but the transformation is pretty dramatic! Stay tuned for the bathrooms and outdoor spaces next!